Joe Lewis was born on March 7, 1944 in Knightdale, North Carolina. He joined the United States Marine Corps in 1962 and was stationed at Cherry Point. 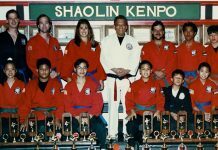 In Okinawa, while serving in the United States Marine Corps, Joe studied Shorin-ryu Karate with Eizo Shimabukuro, John Korab, Chinsaku Kinjo and Seiyu Oyata. 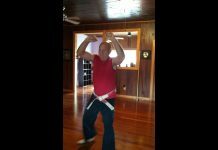 He earned his black belt in a mere seven months. He was one of the first Marines stationed in Vietnam where he met Rocky Marciano. Upon returning to the United States, Joe began his tournament career. In 1967 and 1968, he studied Jeet Kune Do privately with founder Bruce Lee. While training with Lee, Lewis tested Lee’s theories of fighting at tournaments, and Lewis was unbeatable. Lewis also began boxing training with Sugar Ray Robinson and Joe Orbillio, which enhanced his fighting skills even further. (Lewis was originally chosen by Bruce Lee for the part of the villain, Colt, in Way of the Dragon, according to Bey Logan, Hong Kong cinema historian. Bruce Lee and Joe Lewis had a falling out before the film and Chuck Norris was chosen for the role instead. )In 1966, after only 22 months of training, Joe Lewis won the grand championship of the first tournament he entered which was The U.S. Nationals promoted by Jhoon Rhee. Lewis had to defeat 7 opponents before he fought and defeated Tom Lupuppet by a 2-0 decision. Lewis reigned as The U.S. Nationals grand champion from 1966 until 1969. At the 1967 Nationals in Washington, Lewis won the championship by beating Frank Hargrove 3-2 in the finals. Previously, Lewis defeated Hargrove in New York City at ‘Henry Cho’s Karate Tournament’. During that time Joe Lewis was defeated by Chuck Norris. In 1966, at the Long Beach Internationals, Lewis lost an upset decision to Allen Steen. In 1967, Lewis defeated Weiland Norris, Chuck Norris’ brother, Steve LaBounty, Frank Knoll, and Frank Hargrove who he beat for the 3rd time. At the 1968 at Aaron Bank’s ‘Orient vs. U.S. Tournament’, Lewis lost a decision to Japanese American, N. Tanaka. At the ‘First Professional Karate Tournament’ in Dallas, Texas, Lewis won the championship trophy by decision against Larry Whitner, Phil Ola, and Skipper Mullins. 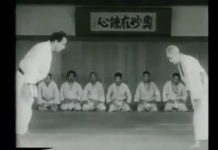 In August, 1968, Lewis was defeated by Victor Moore at the 2nd professional karate tournament in history, World’s Hemisphere Karate Championships. The event took place in San Antonio, Texas and was promoted by Robert Trias and Atlee Chittim. Both Moore and Lewis split the championship purse of 1-thousand dollars. That same year, Lewis defeated Louis Delgado, who had beaten Chuck Norris the year before. At the Waldorf Astoria Hotel in New York City, on November 24, 1968, Joe Lewis won Aaron Banks’, World Professional Karate Championships by defeating Victor Moore and Lewis won the World Heavyweight Title. The title purse Lewis won was only $600. At the All-Star Team Championships in Long Beach, CaliforniaIn in 1970, Lewis lost in yet another upset to John Natividad. However, at the ‘Battle of Atlanta’ promoted by Joe Corley, Joe Lewis defeated Mitchell Bobrow in a closely contested come from behind victory for the Heavyweight Championship, and he defeated Joe Hayes for the Grand Championship. In 1972, at Ed Parker’s ‘International Karate Championships’, Daniel Garcia scored an upset victory over Lewis. 1974 was Joe’s final year in tournament karate competition. Lewis lost to Charles Curry in New York at the Hidy Ochiai National Karate Tournament, held in May. That same month, Lewis won the 2 day PAWAK tournament on May 11th and 12th. Lewis scored victories over Frank Harvey, Smiley Urquidez, Benny Urquidez, and Cecil Peoples in the elimination matches and won the championship with a 4-3 points decision over Steve Sanders. The end came at Mike Anderson’s, ‘Top 10 National Professional Karate Tournament’, where Joe Lewis lost to Eddy “Monster Man” Everett in the finals. Joe Lewis is a veteran of the Vietnam War where he served in the communications field. He has acted in films and on TV, and was briefly married to actress Barbara Leigh. Today he continues to give seminars and work in the entertainment industry. 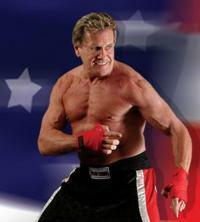 Even though Joe Lewis was retired from point sparring, promoter Lee Faulkner contacted Joe Lewis in late 1969 asking him to fight in Faulkner’s upcoming United States Karate Championships. Lewis agreed to fight only if Faulkner would promote a full-contact karate bout where Lewis and an opponent would fight to the knockout. Faulkner agreed and Joe Lewis and Greg Baines entered the ring. They wore boxing gloves and the announcer identified the fighters as “kickboxers” and that night Joe Lewis won the newly conceived United States Heavyweight ‘Kickboxing’ Championship. It was January 17, 1970 and Joe won with a second round knockout over Greg Baines. Previous to his title winning effort, Lewis won a decision over Chuck Lemmons in the US karate team finals that were held prior to the kickboxing event. Lewis defended his United States Heavyweight Kickboxing title with 10 straight knockouts between 1970/71. The 1970-71 rules for US kickboxing included knees, elbows and leg kicks. On June 20, 1970 in Dallas, Texas, Lewis defended his US title against “Big” Ed Daniels at the U.S.A. Professional Open Karate Championships promoted by Lee Faulkner. Lewis retained his title by knocking out Daniels in 2 rounds. In a rematch, Lewis KO’d Daniels in 3 rounds. On January 24, 1971, at the 2nd Annual United Nations Open Karate Championships promoted by Aaron Banks, Lewis knocked out Ronnie Barkoot at 1:25 of the first round. At another Banks promotion; United States Championship Kickboxing Bouts, Lewis scored a 3rd round knockout over “Atlas” Jesse King. Joe Lewis is the only kickboxer to be featured on the cover of The Ring Boxing Magazine. Promoter Lee Faulkner attempted to organize a legitimate “world” title fight between US champ Joe Lewis and a Thai kickboxing champion but the fight never materialized. Around 1971, the public seemed to loose interest in kickboxing and Lewis retired as the undefeated United States Heavyweight Kickboxing champion that year. His record as the undisputed United States heavyweight kickboxing champion was a perfect 10-0 with 10 knockouts. 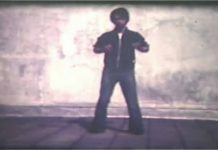 On September 14, 1974 promoter Mike Anderson introduced PKA ‘full-contact’ karate on ABC’s Wide World of Entertainment. These bouts had competitors wearing foam hand and foot protection and the bouts were fought to the knockout. 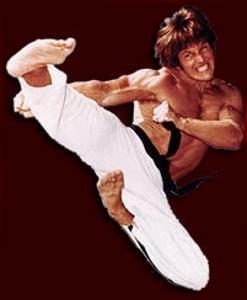 There was differences in the rules as kickboxing rules allowed for leg kicks, but full-contact karate rules did not permit leg kicks. Lewis, the retired US Heavyweight Kickboxing champion was accustomed to full contact fighting. 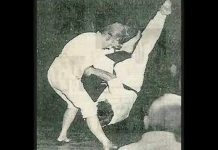 In Los Angeles, California, in 1974, Joe beat Yugoslavia’s Frank Brodar, who was Lewis’ only opponent in the new sport of full contact karate. Joe used a ridge hand to knockout Brodar in the 2nd round to win the Professional Karate Association (PKA) Heavyweight full-contact karate title. The original 1974 PKA world champions included Joe Lewis, in the heavyweight division, Jeff Smith in the light heavyweight division and Bill ‘Superfoot’ Wallace in the middleweight division. These winning fighters received so much publicity in popular martial arts magazines that they were guaranteed status as “legends of the karate world”. In 1975 Lewis was inducted as “1974 Fighter of the Year” in the Black Belt Magazine Hall of Fame. In a 1975 Joe Lewis fought Teddy Limoz in a comeback fight in Hawaii. Lewis lost a 3-round decision in this non-title fight. In September of 75, Joe lost a 7-round decision to Ross Scott after he suffered a dislocated shoulder. Due to contract disputes, Lewis was stripped of the PKA World Heavyweight Championship title. Continuing with his acting career, Lewis starred in Jaguar Lives in 1978 and Force Five in 1981. In 1983, at the age of 39, Joe Lewis launched a comeback earning him a top-10 PKA world ranking. Lewis defeated Bill Morrison, Charlton Young, Melvin Cole and Curtis Crandal, but on April 16, Lewis lost to Tom Hall in an upset. On August 10, Lewis suffered a 4th round technical knockout (TKO) loss to US heavyweight champion Kerry Roop and Roop took the PKA US heavyweight title. Lewis retired after this title defeat. 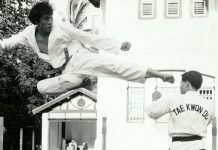 Joe Lewis’s competitive career in kickboxing and PKA full-contact karate ended with a combined record of 14 wins and 4 losses. The PKA World title record was 4 wins 4 losses. In 1990 Lewis at 198 lbs, fought one last exhibition kickboxing/karate match on pay per view against his friend Bill Wallace at 166 lbs. Lewis and Wallace were refused boxing licenses because they were considered to old to fight. This exhibition event ended with two judges scoring a tie and one judge giving the fight to Wallace. Joe Lewis passed away from brain cancer at 10:45am EST at Coatesville Veterans Administration Medical Center on August 31, 2012. He was diagnosed on July 15, 2012 and underwent surgery on July 18, 2012. He fought valiantly against the cancer and was even able to resume leadership of his Joe Lewis Fighting Systems. Even though he fought like the champ he was, his conditioned worsened and he passed away surrounded by family and friends. He leaves a huge hole in the martial arts community that can never be filled. RIP Joe. The Joe Lewis Fighting Systems has recently received many great responses from people and appreciate all the kind words. We look forward to seeing many of you this weekend and wish you safe travels. Below is information on locations, hotels, airports, and events planned. The JLFS Association is working diligently to make your travels and visit as pleasant as possible. Please feel free to contact us with any questions or how we may assist in your visit. If you would like to send flowers, they can be sent to the funeral home (information below). You can also consider to make a financial donation to the Veteran’s Association. At this time, Mike Allen is unable to be reached while working on the many plans being made for this weekend. Please feel free to contact Steve Snyder at SnyderMartialArts@gmail.com with any questions. **If you booked your room before receiving this email, please contact the hotel to put you under this group name. Training session for Joe Lewis Black Belts and JLFS Association Members. Session will be led by senior ranking members of the JLFS. *You will need to RSVP at SnyderMartialArts@gmail.com to reserve your space. Please do not assume you have a space reserved. A confirmation email will be sent to you that your space is reserved. There will be assigned guest speakers at this event. These individuals will be notified by the JLFS Association.